"Unethical marketing - no valid license - rogue"
Well, it turned out that this person had the email address of krauzen.a@1xslot.com – which was a pretty stupid thing to do. Busted for being a shill. Not only do they lack ethics in marketing, they lack scruples in protecting the player. They are virtually unlicensed, and cannot provide basic information that should be listed on every upstanding casino website. Casino Support: Hello. How can I help you? Me: Where are you licensed? Casino Support: We do not provide such information. Me: Then how can you operation be legal? What is I have a problem? Casino Support: You can find all information in the “About Us” page. Me: There is nothing there. 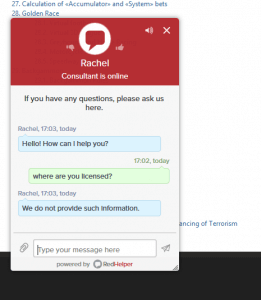 I finally prodded them enough, and the chat support admitted that they were licensed in Cyprus. Incidentally, a Cyprus casino license is about as valid as one from Curacao. So there you go. UK player beware – this casino will accept your bets, yet they are not in compliance with the UKGC. I suspect that the games are not legit – so I would avoid them like the plague. Oh really? They freely admit that they are scamming that many players? What a laugh! I would avoid playing any games at this casino since avoid stating where they are licensed. It’s a good chance that their games are fake. Just another scammy clip shot joint ready to fleece the unwary. Stay alert – avoid these crap holes at all costs.